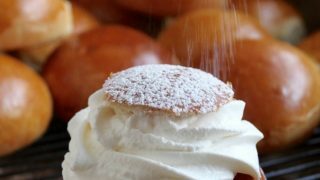 This semla recipe, will provide you with Sweden’s version of Scotland’s cream buns (or vice versa!) 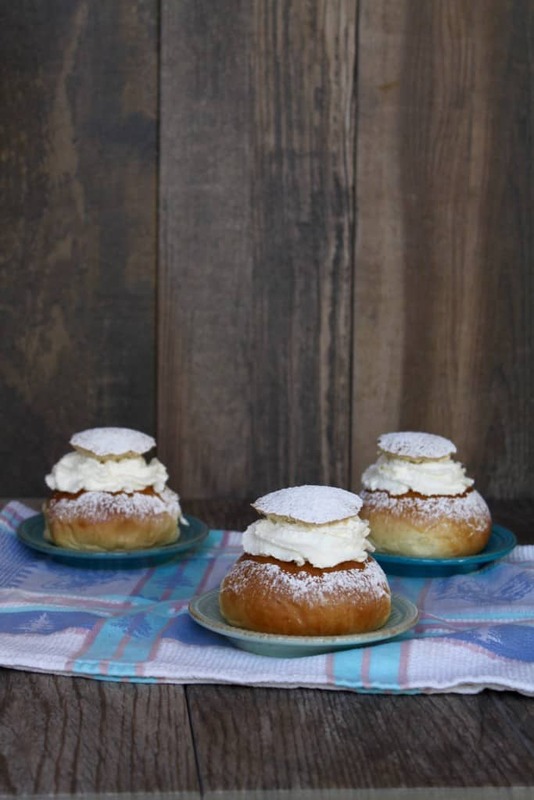 are a delicious way to celebrate Fat Tuesday with a Swedish twist! 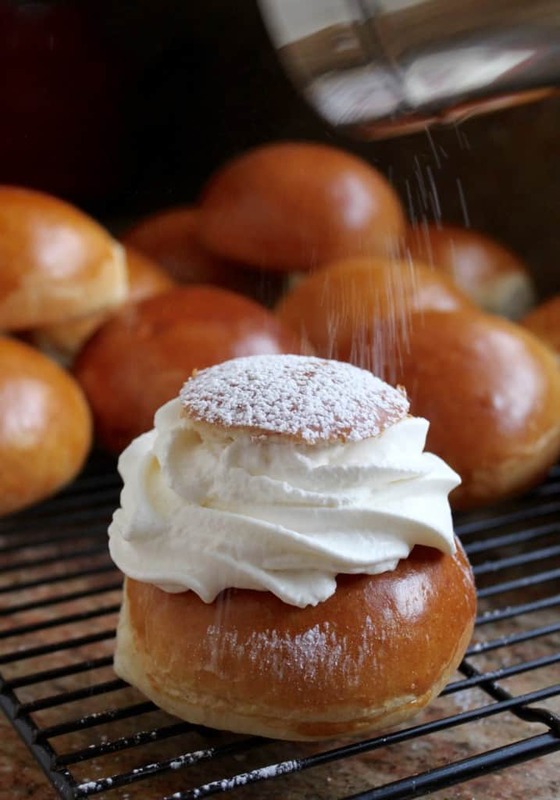 Semlor are a delicious tradition in Sweden, but you can make them in your own kitchen, no matter where you live! If you’re already a fan of my Scottish Cream Buns, then you’re going to love this semla recipe! What are semlor, or what is a semla? First of all, let me explain that semlor is plural for semla. 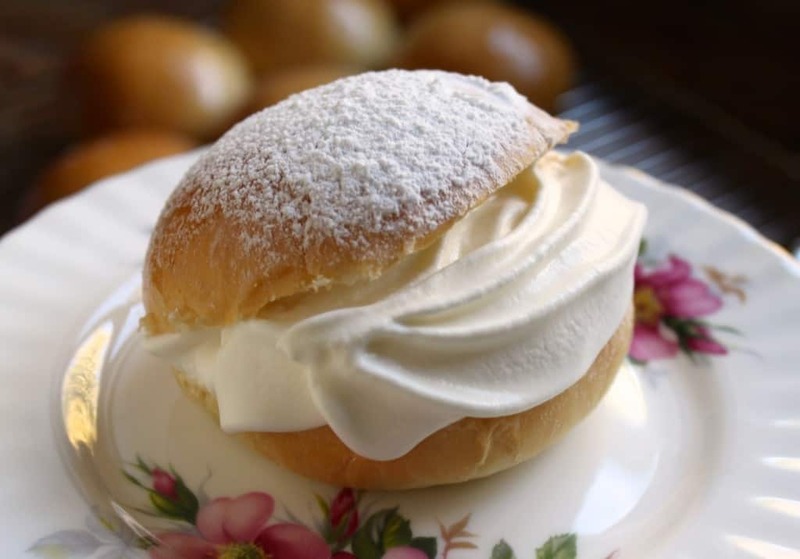 A semla is a Swedish cream bun (a cardamom version of Scottish cream buns), which has a marzipan type filling, whipped cream and dusted with powdered sugar. I created this semla recipe from my cream bun recipe and a Swedish friend’s recipe for the filling. 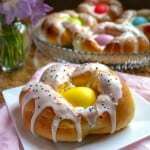 I did some research into these traditional Swedish buns which have a very colorful history. 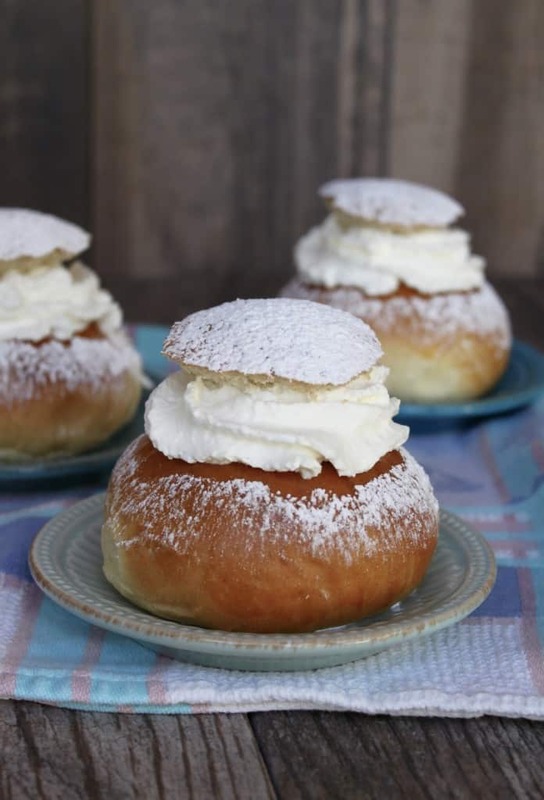 Apparently, King Adolf Fredrik of Sweden died in 1771, after consuming 14 of these creamy buns of goodness which were soaked in warm milk (a traditional way to eat them). They’ve also become a bit of an obsession with the Swedish people, as they are no longer only served for Shrove Tuesday, or fettisdag, sometimes appearing in bakeries before Christmas and all the way through Lent. I called my Swedish friend’s mother to get some proper advice on the the filling as I’d never even tasted a Semla before. Although I don’t like marzipan, she assured me that I’d like her recipe, as she doesn’t like marzipan, either. I will now attest, if you make your own, the almond paste is delicious. She told me to use ground almond meal (not almond flour as it’s too fine), an egg white and powdered sugar for the filling. I’m lucky enough to have a friend with chickens, so when I heard that I needed to use a raw egg white, I went over to pick up some eggs right from the nest! Unless you can get your hands on such fresh eggs, I wouldn’t advise consuming raw eggs, so you can use an alternate filling recipe I include below. The almond paste I made was a bit heavy, so next time, I’d whip the egg white, and then add the ground almonds and sugar, which is how I wrote the semla recipe below. Although they can just be eaten as is, as I noted above, Semlor can also be served in warm milk, which my husband tried, and thought was okay. I can’t say that a soggy cream bun is my idea of a great sweet, so the Brit in me will continue to eat them “sans-milk”, as they are absolutely wonderful this way. It’s obviously a cultural thing, and I don’t think there’s anything wrong in serving Semlor this way, my preference is just as is. 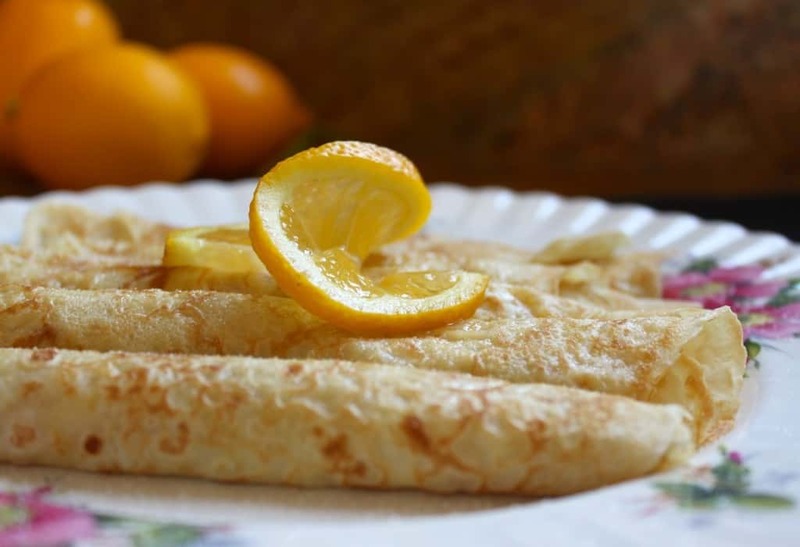 Remember, today is Shrove Tuesday, but you can make these all the way through Lent if you go by today’s Swedish custom. I actually wouldn’t mind making this semla recipe any time of the year. If you’re looking for the traditional British dish for today (Pancake Tuesday), you can find the recipe here. 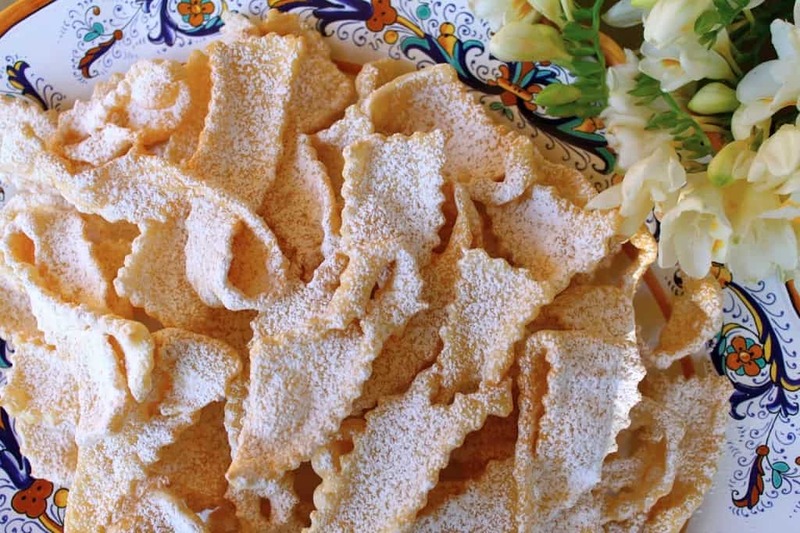 An Italian treat for Carnevale are these beautifully light and crisp bows of dough which go by many different names, but two of which are Frappe or Cioffe. 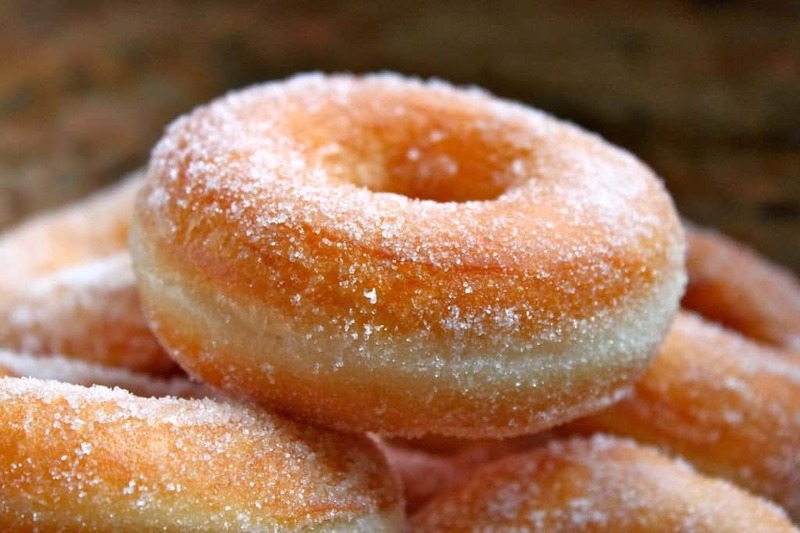 And last, but not least, if you like using yeast recipes, I urge you to try my PERFECT YEAST DOUGHNUTS! 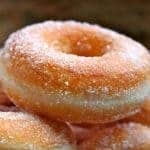 In bread machine or stand mixer, place the lukewarm water, yeast and 1/2 tsp of sugar. Allow to rest for a few minutes, until the yeast begins to grow. Mix the milk, melted butter, beaten egg together, then add to the yeast mixture. Add the cardamom, flour, 1/3 cup (2.5 oz) of sugar and salt, and turn on machine (dough setting on bread machine or use a dough hook if using a stand mixer.) Mix and knead by hand if you aren’t using a machine. Dough will be slightly sticky. 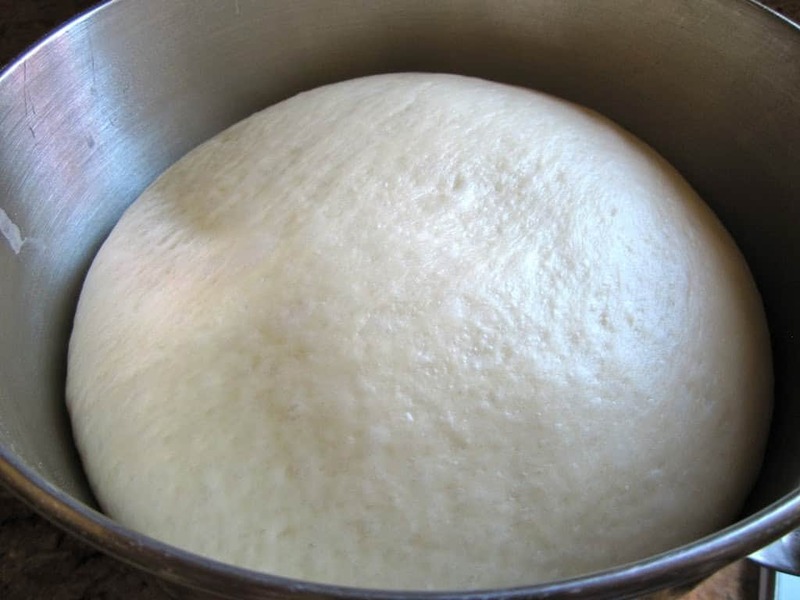 Allow cycle to finish on dough setting; with stand mixer, or by hand, when the dough is ready, cover it and let rise on the counter until doubled in size. After it’s risen, punch down the dough, and let rest for 5 minutes. 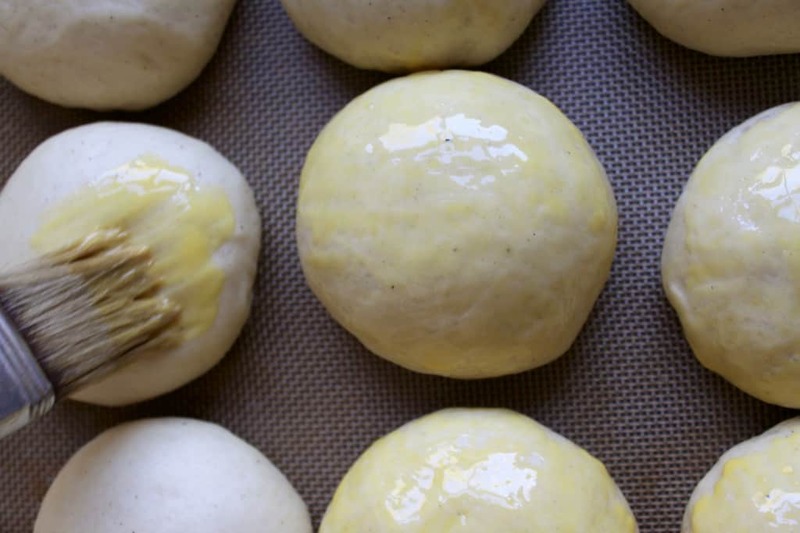 Cut pieces of the dough and shape into round balls (about 15 to 18), and place onto a greased cookie sheet (or silicone sheet) about an inch apart. 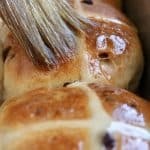 I baked mine with the buns too close together and they touched, so don’t put them as close as I did in the photo below. I also weighed mine so they would all be of equal size, however it’s really unnecessary unless you are a Type A personality, like me. :) Place the tray in the oven (do not turn it on) to rise for about half an hour or until doubled in size. (I put a large cup of boiling water in the oven for steam, so the buns don’t get a hard crust). Preheat the oven to 350º F (175ºC) then cook the buns for approximately 20 minutes, or until golden brown. While they are baking, prepare the almond paste. Whip the egg white until soft peaks form, then fold in the ground almonds and powdered sugar. Cover and set aside. Remove the cooked buns from the tray, and place on a cooling rack. When the semlor are completely cool, whip the cream and assemble them. 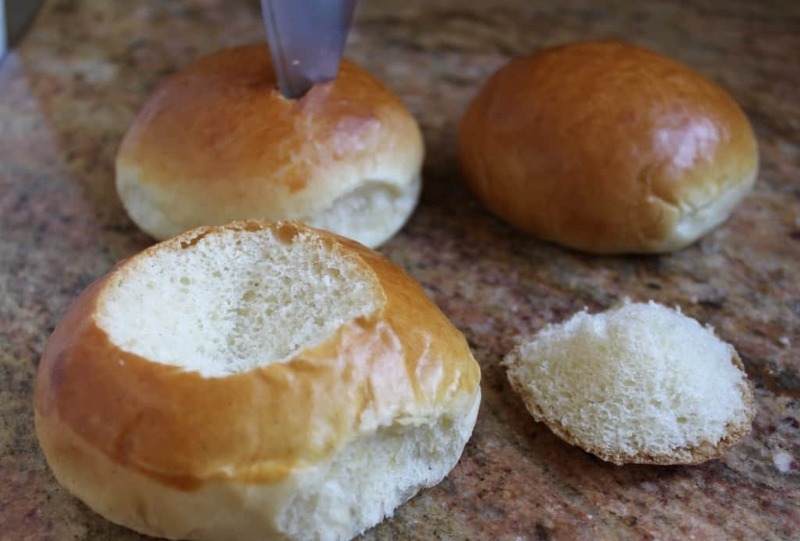 Begin by slicing into each bun with a sharp knife. Now, cut down into the center of the bun to create a space for filling in the bun. I made circular cuts, but you can make them triangular if you like. Then put a teaspoonful, or more, of the almond paste into the center. Next, top with whipped cream. I used my ISI Cream Whipper, which I adore! Place the top on the cream, and dust with powdered sugar (this is what I use to dust them). Ready to serve! 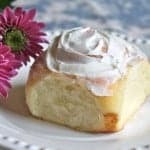 These brioche semla buns are light and flavorful, especially with the cardamom in this semla recipe. I hope you enjoy this semla recipe as much as my family did! These were my first semlor, and most definitely won’t be my last! 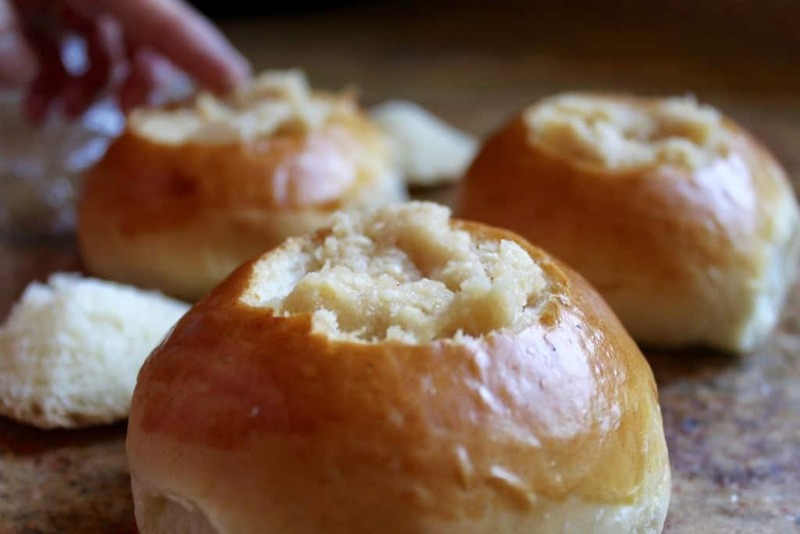 A traditional Swedish cream and marzipan filled brioche bun which is made for Lent. Begin by cutting a top on each bun with a sharp knife, cutting down into the center of the bun to create a space for filling in the bun. Then put a teaspoonful, or more, of the almonds paste. Place the top on the cream, and dust with powdered sugar. Repeat with remaining Semlor. Please let me know what you think of my semla recipe below! I just had a question about the almond filling. In your post, you say that for an alternate to using egg white to look at the link above, but I wasn’t sure which link this was. These look so good, and I’d really appreciate the clarification. Hi Cassy, thanks to you, I now realize that the link I was referring to is broken. It was on the page I linked to about the king dying from overeating Semlor. I can vouch for this recipe as an expat Swede. They turned out fantastic. Swedish recipes will usually assume you have fresh yeast, but that’s harder to come by here in the UK. I filled them with ground Swedish almond paste (mandelmassa) mixed with the scooped-out crumbs and some unwhipped cream. Almond paste does not have the same sugar/almond proportions as marzipan and tastes better, in my opinion. I don’t think anyone in Sweden would use marzipan, but then almond paste is readily available in stores there. I did not end up using all of the flour in your recipe, but the buns turned out great! This is the first time I’ve successfully made a yeasted bread all by myself that didn’t have any problems. I used a filling recipe from another source: breadcrumbs from hollowing out the buns mixed with grated marzipan and slightly dampened with milk and then topped with whipped cream (sweetened and a dash of vanilla/drop of almond). Excellent. Like anything in print, it has to be read with common sense in mind. My neighbors treat their chickens like chickens and we all wash our hands. There is no misconception about my confidence in backyard chickens given that common sense is used regarding health and safety. Did you read the entire article or just the headline? Hi Claudia! 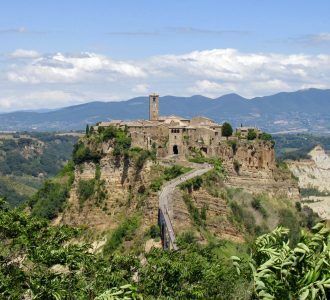 Yes, I’m pretty mixed up myself (I’m actually Italian) so my recipes rather follow suit! :) I am very careful to post proper recipes, though! I agree with you when a classic is changed outrageously, as you described with the chocolate or wrap semlor! Ugh. That’s good to hear that the milk drenched semlor isn’t as popular as I thought! 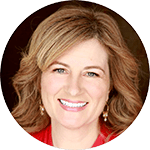 Regarding the weight, I am actually going to be switching all of my recipes over to a new system and that way they will have cups and grams, however, I’m currently traveling in New Zealand, so it won’t be until I return. Some of my recipes are already in grams, too, but not all of them. Both of my scales have ounces and grams as options, so when I started writing recipes I did them in cups (for US) and ounces (for my UK readers), however I think many newer scales in Europe ONLY have the gram option, which is probably what you have. I’m sure you could make the almond filling safely using Just Whites, as they are pasteurized dried egg whites. I’ve never used that product before, but that sounds like a good idea. Thanks, Shelley! Thank you so much for this recipe. The instructions were written with great clarity and the illustrations were succinct. We were Sweden in Late January and tried these treats for the first time in our lives, we immediately loved them, and your representation is all things authentic. Kudos to you and thanks for sharing!!! Oh thank you SO MUCH for this comment! I have never been to Sweden to taste Semlor, so this means a great deal to me! So glad you could enjoy a taste of Sweden at home :) Thanks again, Tony! 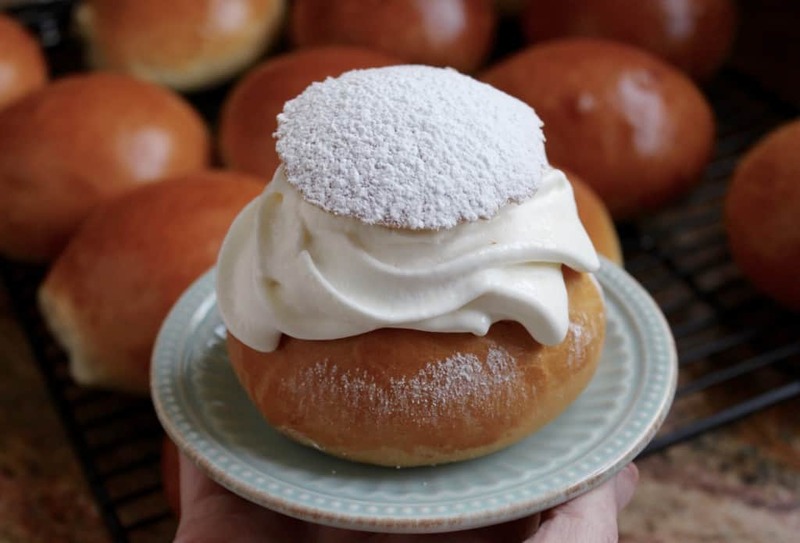 I grew up in Sweden, and a childhood friend of mine just posted a picture of herself eating a semla, which triggered a powerful sensory memory of these buns. So I started looking at recipes and I have to say yours seems like the only one I would even consider using. Kudos on the clarity of your directions, the history, and the gorgeous presentation. I do have one question: I never use a machine to make bread dough. 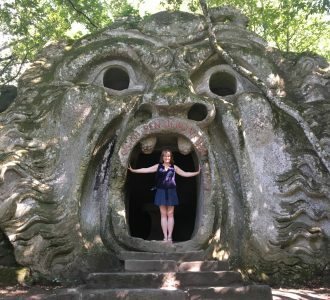 How would you make this by hand? What a compliment, Susan! Thank you so much! It’s very simple to make these by hand. just do step one in a bowl, place the dry ingredients in a larger bowl, then pour the liquid ingredients into the dry and stir with a wooden spoon (or your hand). Continue to mix by hand, then when it comes together into a dough, roll out onto a floured worktop and knead about 10 minutes. Allow to rise in a draught free place until doubled, then follow the rest of the instructions starting at step 4. Enjoy!! These look unbelievable! I love that almond filling! These look amazing! When I first saw the picture, I thought they were going to be more of a pate choux dough, but this is way easier. Thanks for sharing! I always love learning about different traditional foods. Love this! Haha! Can you even imagine that? Crazy! Yes, they are definitely delicious, though! Wonderful, Jay-Jay! I’m so happy to hear that Sweden is on board with the “no-sugar” policy with cream! I can’t stand sweetened cream (having grown up in Scotland) and recently was in Italy and was surprised that they added sugar to cream in a little shop that served pastries. The man actually told me that unsweetened cream “non essiste” (it doesn’t exist)! haha! I have a Swedish boyfriend and I’m trying to make these for Christmas as a surprise. I am having a hard time getting my dough to rise. On my third try. I’m a horrible baker! I was using a different recipe but them found yours. I noticed you don’t call for baking powder? Any reason? Any tips would be wonderful thank you! These look incredible! 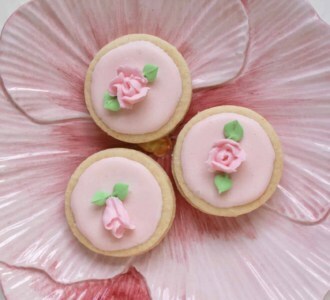 Love the historical context of the recipe too — definitely not trying to eat 14 of these!! These are beautiful! 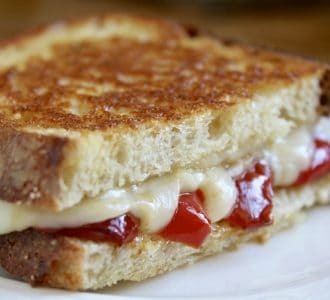 I could really do with one now, they look so decadent! you had me at marzipan! These sound delicious! You’ll have to try these, Cynthia! Delicious! This is really a great post! I’m such a food geek and always love to know about the cultural significance or history behind recipes! And wow – this also looks absolutely, incredibly delicious, too! 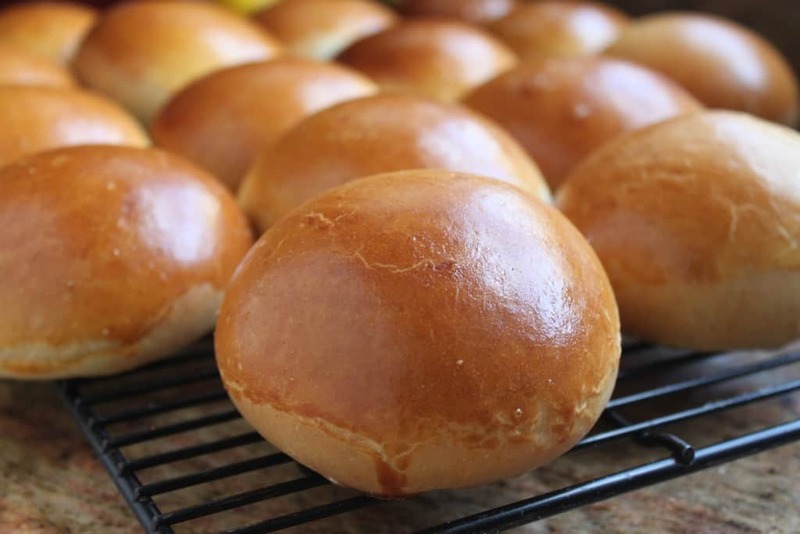 Although … I think I’m with you and your husband on giving the warm milk idea kind of a pass … why ruin these beautiful buns that are so perfect just the way they are?!?! Wow, I have never heard of these or seen them. They look amazing!!! Oh my. 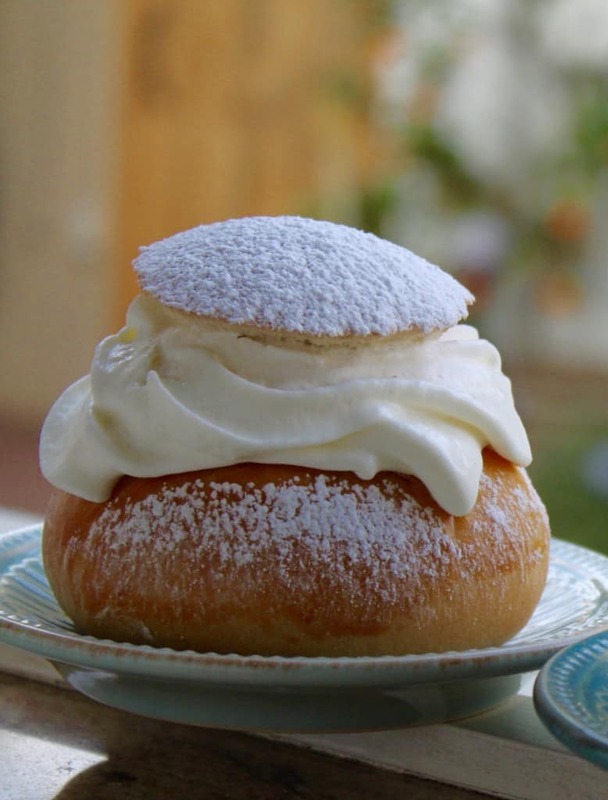 I hadn’t heard of Semla until yesterday for Mardi Gras when I saw a couple of Swedish posts and was intrigued. Love how you’ve explained it all to us, Christina – and boy, they look and sound absolutely delicious! And I love almonds and cardamom too. What an absolute treat. If you like cream buns from home, you’d love these too, Jill! I think I got fat just looking at these amazing buns! I love cardamon in bread and pretty much everything else so I know I will love this recipe. I need to study up on my Swedish heritage as I am not familiar with Semlors, but I guarantee I will be very soon. I made these today with all-purpose flour. Delightful and pillowy! Filled with a dab of lingonberry jam and whipped cream. 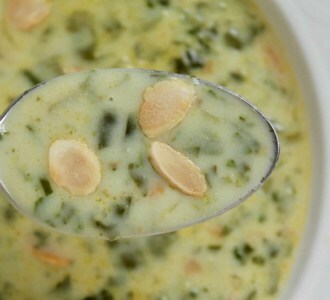 Perhaps tomorrow I’ll make an almond custard/pastry filling. 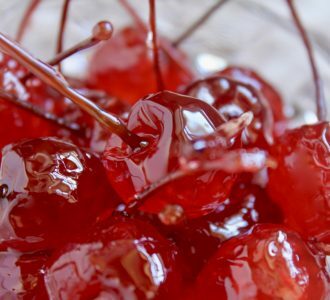 As with most sweets, these would be delicious year-round. 14 semlor buns did him in???? I can’t even believe he ate that many. They must be insanely good! That cream!!! Oh my word. So now I “need” an ISI Cream Whipper. Gorgeous photos Christina. Oh my goodness they look delicious I swear I want to bite into my phone and eat them all up. I can almost smell them too. Thank you so much for sharing the recipe and story too!! They look amazing! I don’t think I would ever try them myself but I would purchase in a bakery any day! That cream looks so so good! Lovely post and recipe as always! I love the history and story with each recipe!! Angela, you know you are welcome in my kitchen any time you like! You should come over one day and we’ll cook together! It would be so much fun! Oh Dear Sweet Heaven!!! These are making me drool. They look like they just melt in your mouth. I am not sure I could actually make these, because I think if I did, I would eat them all by myself. (Possibly in one sitting.) I have never heard of Selmor, but I am thinking I am going to be a big fan!!! Thank you for sharing such a beautiful little creation!! I love the look of these and I absolutely love marzipan – but good marzipan! This is something I definitely want to try for a party. Happy weekend!